How Long Can Quiche Be Left Unrefrigerated? An easy breakfast meal to throw together, quiche's buttery pastry and velvety custard filling makes it a standout at both brunch and breakfast. Fill your quiche with cheeses, meats, vegetables and seafood, but ensure you do not do one thing -- leave it out more than two hours at room temperature. Though quiche may seem stable when cooked, it is highly perishable and must be stored accordingly to prevent food borne illness. There are a couple basics that define a quiche -- a firm crust and silken egg middle. The flaky pastry crust is packed with buttery flavor and then filled with a mixture of eggs, cream, milk and fillings such as bacon, crab meat, goat cheese, leeks, ham or asparagus. 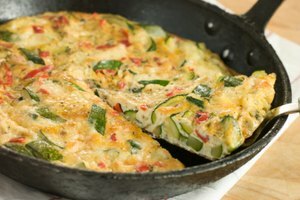 Because the basis of the quiche is made from eggs, dairy and sometimes meat, it is perishable and must be refrigerated. 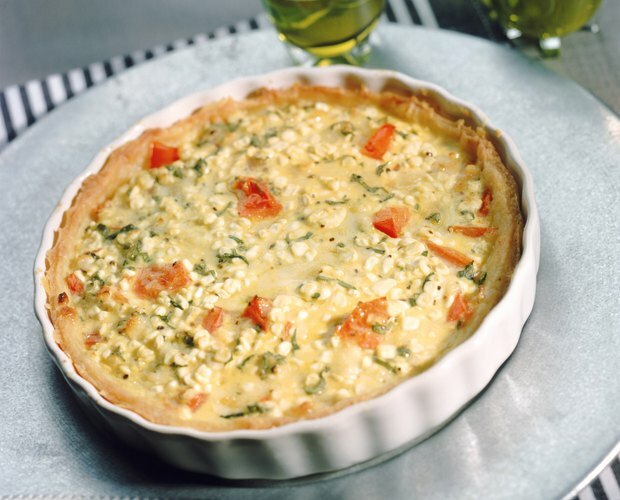 Once cooked, quiche must be stored in the refrigerator within two hours of cooling. 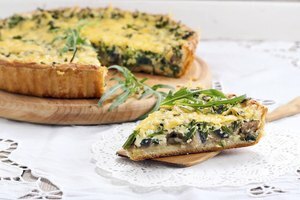 Quiche is commonly eaten at room temperature, which is fine in terms of food safety, but it must be refrigerated within this two-hour window. If you are serving quiche at a buffet or brunch, keep it warm using a chafing dish or other food-heating system to maintain a temperature above 140 degrees Fahrenheit if it will be sitting out for more than two hours. Quiche will dry out if held at high temperatures too long; ensure not to overheat it. Quiche should be stored in the refrigerator covered with plastic storage wrap for the best results and success in reheating. Wrapping the entire quiche or cut pieces of it tightly in storage wrap will lock in the moisture and ensure that your quiche reheats well. Be sure not to store quiche in the refrigerator before it is cooled as the condensation can cause the crust to become soggy during storage. Eat all quiche leftovers within three days of storage in the refrigerator. 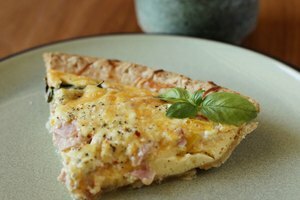 To reheat cold quiche, the oven is the best method to preserve the quality as well as ensure an even heating. Place cut quiche pieces into a baking dish covered with aluminum foil. Heat for 15 to 20 minutes at 350 F or until the internal temperature reaches 165 F; use a kitchen thermometer to ensure the internal temperature. Remove quiche from the oven and serve or cool to room temperature and serve.